The Birmingham Jewish Federation and Levite Jewish Community Center have joined together to collect items for victims of Hurricane Florence. 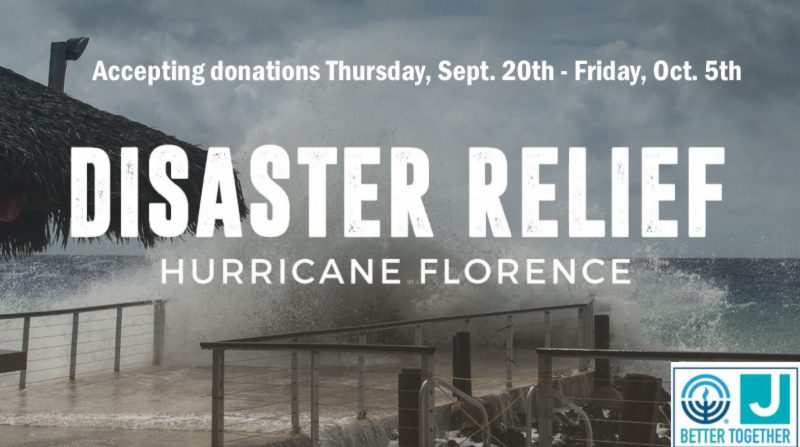 Items needed are water, first-aid kits, diapers, wipes, non-perishable foods, infant formula, personal hygiene supplies, black trash bags, gloves and paper goods. Non-perishable foods are one of the most needed items. We are accepting items on the above list only and all donated items must be new and unopened. The drop-off location for donated items is the LJCC’s front lobby. The BJF & LJCC will be collecting items through Friday, Oct. 5. This drive was started by LJCC board member and BJF supporter Jennifer Kulbersh, who is from North Carolina. We are grateful for Jennifer’s leadership in this effort and appreciate those who have donated items already. If you have any questions, please contact LJCC staffer Priscilla Denard at pdenard@bhamjcc.org.